Young farmer Izzi Rainey is mastering the art of balance. Running an up and coming textile business while also maintaining her passion for her beef farm at home, it is with realism and optimism she is pursuing both successfully. 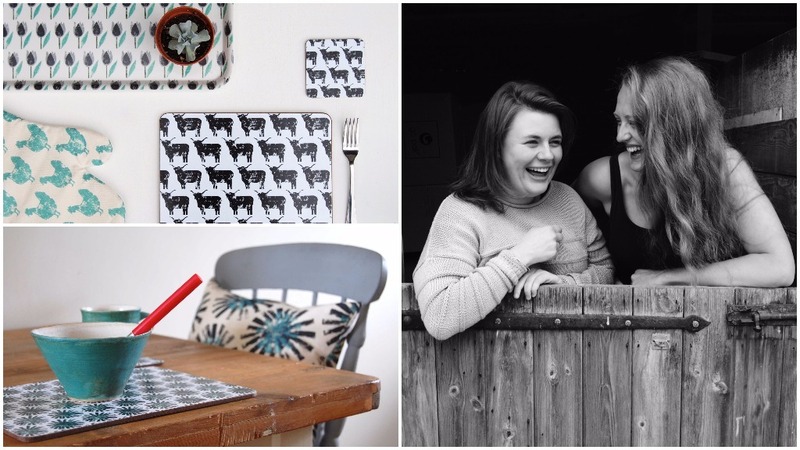 At just twenty-five, it is hard to believe the down-to-earth approach Izzi Rainey takes on when it comes to balancing a booming new textile business and farming. With a degree from the Glasgow College of Art under her belt and a passion for livestock, she is undoubtedly enjoying every opportunity that comes her way. Her textile company, named Izzi Rainey, which she runs with close friend, Lara, is growing rapidly. So how do you juggle this alongside creating a profitable beef herd? “I love doing it but only can do it because of my family. We all help out and my studio is located on-farm. “Visit my studio and you could find me outside washing the cows down, or if I’m in the middle of sewing for example, I can always nip out to lend a hand and come back to my textiles. 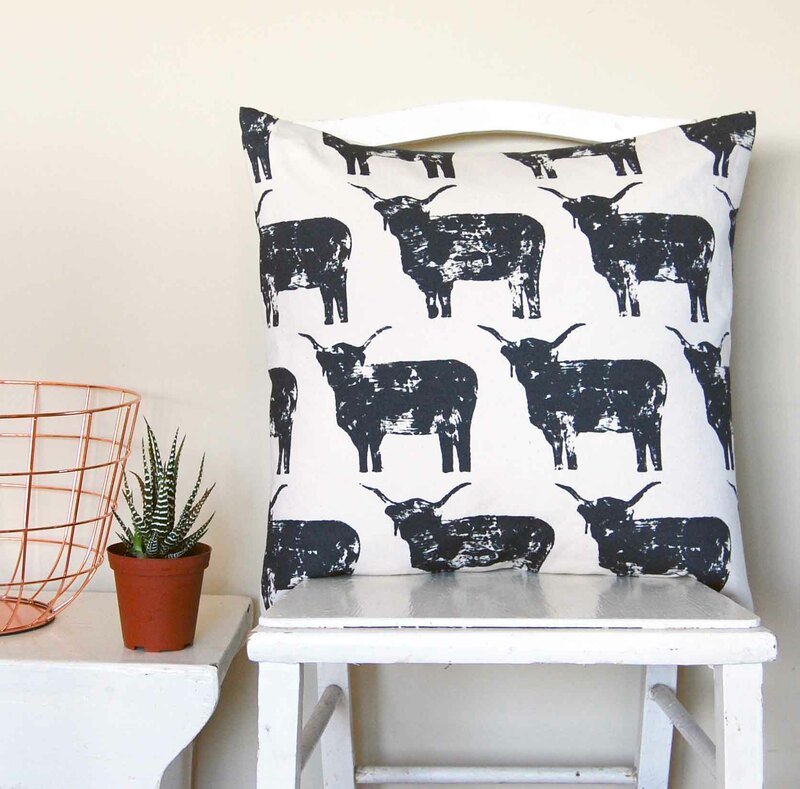 Having grown up on the family farm in Norfolk, it was only after designing prints for free at University she realised there was a profitable future in heading home and setting up the textile side of things alongside the farm work. Self-funded from the beginning, Izzi isn’t afraid of the relentless graft it takes to support a home-based business. In addition to everything else, she even holds down a part-time job on a local beef farm every morning, to ensure she continues to support herself in her venture. With a studio converted by her Father, it means there is no rent to pay and all investment can go straight in to the products, and while she could easily have landed a job designing for a large company, it was a question of missing out on her cattle – the main inspiration for her designs. Izzi’s rural life and textiles work fluently alongside one another, each element naturally enhancing the other. Over the last three months, Izzi Rainey has truly bloomed and is growing at an alarming rate, she says. After sealing a deal with prestigious high-street giant John Lewis, the girls are blasting sales targets out of the water, themselves surprised at the reaction to their range. After only seven weeks in store, they have received around £4,000 worth of sales. They have not however forgotten their humble beginnings, recalling a speech they did for a local YFC when starting out 2014. “It’s funny because when asked what the pipeline dream was, we said it would be for John Lewis to feature us. Present in around twenty independent stores too, Izzi is evidently passionate about bringing her farming heritage to the forefront. As part of the Made Locally scheme, the backdrop for their display in John Lewis is centred on the story behind the business. “I want people to know I am truly involved in the farming side too. The business currently pays for itself and made a £35,000 turnover in 2016 - a figure Izzi would like to double this year, the aim being to make a living from it by 2019. But, will the exponential growth of the textiles get in the way of her farming life? “I will always farm alongside. Speaking fondly of a favourite family story – she was taken to the Royal Highland Show at only two weeks old - the adoration she has for her roots is striking. With a view to eventually build the family herd back up, three Lincoln Red Heifers are being introduced to the farm next month and they’re looking to increase their number of Highland cattle – chosen because they suit the terrain at home. In terms of promoting the industry, her artwork is one way to do so. “I think the fact that our products are made in the UK and many here on the farm itself is a huge selling point for us. “One of my future goals is to interview local farmers and create cards from the experience. “I want each one to have a tale behind it. Be prepared to fail. Things go wrong everyday – especially in farming so it will do in your business too. Think long-term - nothing happens overnight. Ask questions and ask again. People seem to be afraid of looking unprofessional or vulnerable but most times, people want to share their knowledge. This is also true for farming.